MacCullock's Garage and Car Sales is situated near the centre of Okehampton and we pride ourselves on providing a 1st class service and affordable prices. Our sales department have a range of different cars in stock and can also source a car for you from outside our stock if you wish to buy a specific model we do not currently have. Please come in and see us or call 01837 52776 to arrange to see our selection of quality used cars or to book your vehicle in for an MOT, service or repair. Provide you with a fixed quote of an estimate, both inclusive of parts, labour and VAT when requested. Only charge you for work completed and parts supplied and fitted. Allow you to follow your vehicle's service schedule. Work to high standards and continue to achieve the key industry standards set by the RMI's IGA. Explain things clearly and treat you and your vehicle with respect. Use up to date technical information, techniques and tooling. Comply with the TMG 'Code of Practice for Service and Repair'. 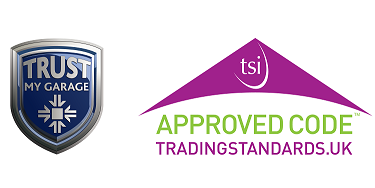 More information about the Trust My Garage scheme can be found at their website; trustmygarage.co.uk where you can also see our customers' reviews.